In this topic you will learn how to search for specific videos using the Quick Find feature provided in the Analytics module. 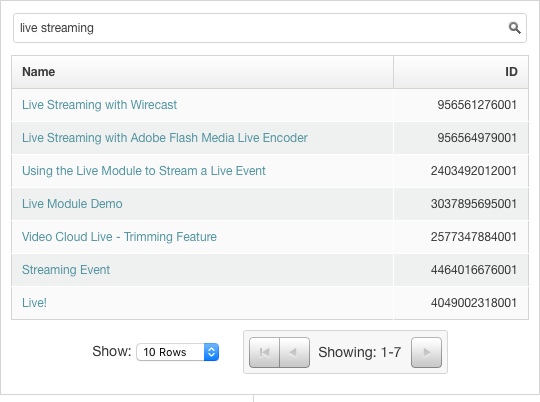 The Quick Find feature in the Analytics module can be used to search for a specific video. After entering search criteria, Quick Find will search the video name, short description, long description, tags, video ID and any custom text fields you may have. A list of matches will be displayed below the search field. Note that deleted videos are not searchable through the searching functionality but we do keep analytics for them. You can found them by expanding/navigating through the performance report and using the browser search function or by downloading the report and searching on a spreadsheet app. Clicking the link to a match will open the report that is "in context". For example, if you are looking at the engagement for your account and then use Quick Find to locate a specific video, clicking the link to the video will open the Engagement Report. If you are looking at the Performance reports, searching and clicking a link will open the Performance Report. If you want to match multiple words, just wrap the term in quotes. The Analytics module also provides the ability to search specific fields, search based upon date and include or exclude specific terms. This will search for all videos with an updated_at value between Aug 1, 2013 and October 8, 2013.